Wholesale Trade Suppliers Tied elastic rings, many options from stock. Tied elastic rings, many options from stock. Trade & wholesale supplies of tied(knotted) fine elastic rings for hang-tags and labels, bottle necks, etc, many options available from stock. ( A secure and attractive knot with no sharp metal or hard plastic to scratch, snag or otherwise damage or mark your product.). 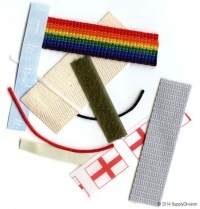 We also offer a lacing/stringing service for your printed tags and labels etc. Go HERE for flat and round elastic rings and tassels for menus, folders etc. 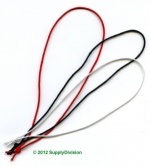 160mm Circ-80mm Long Pretied Loop, 1000 pack. Fine ecru/White luggage tag/mask elastic. Fine Black luggage tag/mask elastic. ELSC1.5mm: 1.5mm Round elastic, shock cord. ELMETRND1.5mm: Approx. 1.5mm Round metallic elastic. ELMETB40479SC1.7mm : Approx. 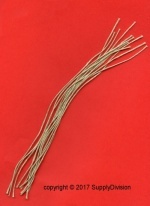 1.7mm Round metallic elastic. Fine Black Shirring elastic. Pre-cut in approx 300mm lengths. Minimum order 1Kg (Approx 15,000pcs per Kg). Picture for illustration purposes only. Home > Elastic > Tied elastic rings, many options from stock.